But I have decided to change my mindset about Hair! I have decided to look it as another form of art (as Makeup & Photography are forms of art) rather than just something that makes me more marketable as a Makeup Artist. 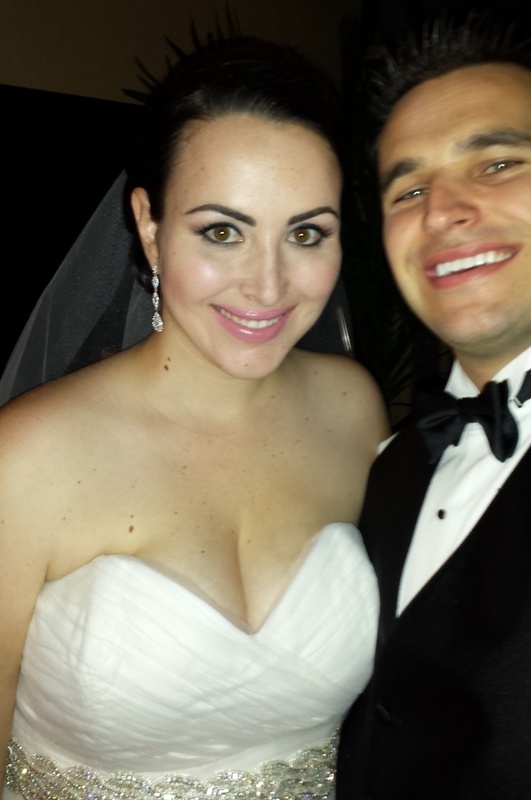 So last Friday, December 11th, I was booked to do Bridal Makeup & Hair at the Terranea Resort in Rancho Palos Verdes. 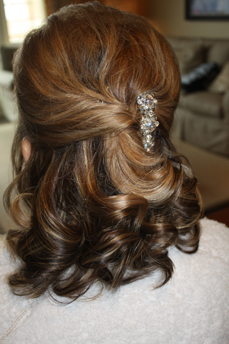 Beforehand, the bride and I had discussed how we were going to do her Makeup, and she showed me a photo of how she wanted her hair done (click HERE for the photo) except she wanted to leave her side bangs out. So with my frame of mind officially changed in regards to hair, I looked at the photo as an artistic challenge, and that’s when I became excited about it! Her wedding had a Peacock theme (so fun! ), so for her eye makeup, I created a smokey-eye with purple shades and a pop of teal right at the lash-line, which really complemented her hazel eyes! And the hair turned out perfect! I actually enjoyed doing it! And my client loved it! 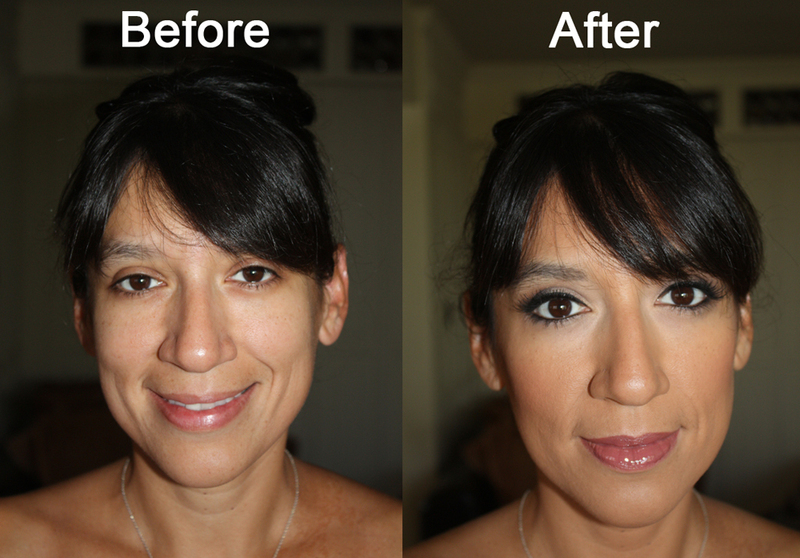 She said her Makeup and Hair turned out exactly how she had wanted them…Yay! I really love doing Bridal Makeup & Hair! BTW…I have a wedding coming up Saturday, December 26th in Long Beach for which I’m doing the Makeup, Hair AND Photography for! So exciting! Be on the lookout for the photos in a few weeks! You’re spending thousands of dollars on your wedding, so don’t skimp on your appearance! A professional makeup application makes a huge difference in the way your makeup will look, last and photograph on one of the most special and important days of your life. And don’t follow the trends because pictures last forever. 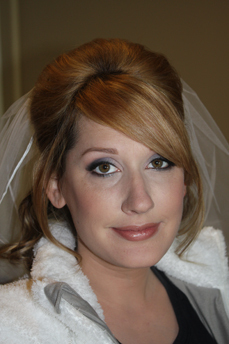 Use a professional, someone like Briana, who specializes in Bridal Makeup to ensure a beautiful, timeless look for you! I always forget to take a “Before” picture…argh! She wanted a look that would express “Old Hollywood Glamour,” something classic, glamorous and vintage-inspired. Therefore, I created a cat-eye effect with thick, black liquid liner, emphasizing her lashline, and paired it with a bold, deep red lip color to complement her skintone. This look is clean and timeless! I did not apply false lashes as Ely will be getting lash extensions for her wedding day. I will also be doing the makeup for Ely’s 5 bridesmaids who will be wearing a gunmetal-grey dress. I plan on creating a soft, smoky charcoal eye for them with a subjective lip color, but we’ll see what happens when I get there. And I will be staying through the ceremony to provide touch-ups for the Bridal Party before their pictures prior to the reception. I’m really looking forward to Ely’s wedding and being a part of it!